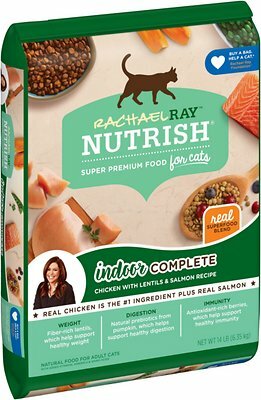 Rachael Ray Nutrish Indoor Complete Chicken with Lentils & Salmon Recipe Natural Dry Cat Food is a delicious protein-rich recipe packed with lentils, salmon and USA farm-raised chicken as the first ingredient. This recipe is specially formulated with a unique superfood blend of vitamins, minerals and taurine to help keep your indoor kitty healthy and happy. Chicken, Chicken Meal, Corn Gluten Meal, Dried Ground Peas, Lentils, Pea Protein, Poultry Fat (Preserved with Mixed Tocopherols), Dried Plain Beet Pulp, Powdered Cellulose, Salmon, Ground Rice, Natural Flavor, Salt, Choline Chloride, Iron Oxide (color), Taurine, Dried Cranberry, Dried Blueberry, Dried Pumpkin, Vitamin E Supplement, Zinc Sulfate, Ferrous Sulfate, Calcium Carbonate, Niacin, L-Ascorbyl-2-Polyphosphate (Source of Vitamin C), Dandelion, Manganese Sulfate, Copper Sulfate, Vitamin A Supplement, Thiamine Mononitrate, d-Calcium Pantothenate, Sodium Selenite, Riboflavin Supplement, Pyridoxine Hydrochloride (Source of Vitamin B6), Biotin, Menadione Sodium Bisulfite Complex (Source of Vitamin K Activity), Vitamin B12 Supplement, Folic Acid, Vitamin D3 Supplement, Cobalt Sulfate, Potassium Iodide. These are recommended feeding guidelines that should be adjusted as needed to obtain optimum weight. Provide a bowl of fresh, clean water for your cat at all times. Close package tightly between feedings or store in an airtight container to keep product fresh. Regular veterinary visits are recommended to ensure your cat's good health. Use a standard 8 oz dry measuring cup for determining food amounts. Adult cats with normal activity may be fed the recommended amount in 2 meals per daily. Because Rachael Ray Nutrish may offer different ingredients than your pet is used to, it may take up to ten days for your pet's system to become acclimated to Nutrish. Slowly mix with his other food over a five- to ten-day period until your pet is solely eating Nutrish. Rachael Ray knows that when you use real ingredients, you get real flavor. 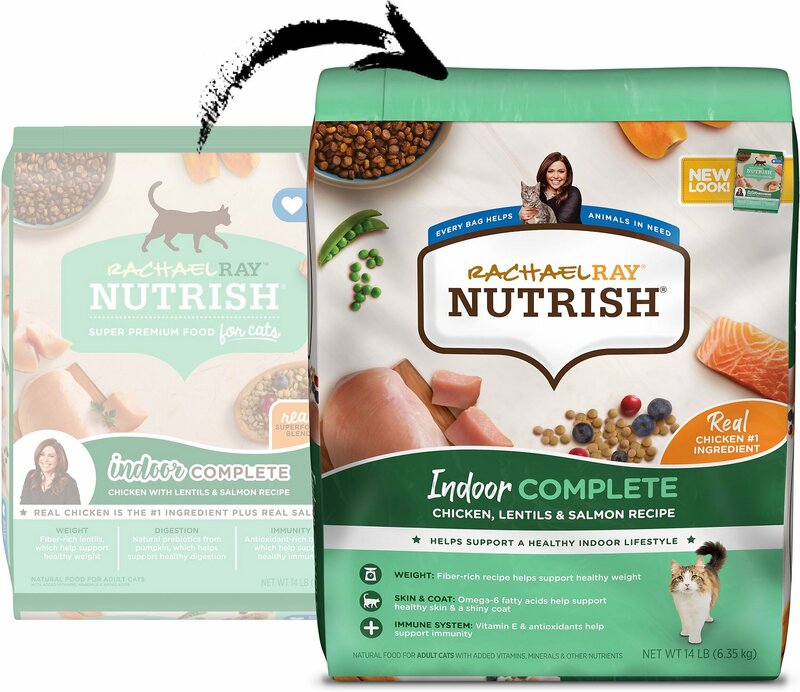 In her recipes for Nutrish Super Premium Food for Cats, she certainly doesn't skimp or cut corners. Only the highest quality seafood or poultry goes in, along with wholesome fruits and veggies for meals that taste great and deliver the complete nutrition your kitty needs. Rachael Ray took a page from her own cookbook and used her culinary expertise to fill your pet's bowl with flavorful, protein-rich meals inspired by her popular recipes. Nutrish Dry Cat Food features real salmon or real, U.S. farm-raised chicken as the main course, so your cat's sure to find something she'll love, whether she's a fan of poultry or seafood. Indoor Complete is specially formulated for indoor kitties with a satisfying combo of salmon and chicken, plus a superfood blend of cranberries, blueberries and pumpkin. It's full of antioxidants to support healthy immunity, lentils that are rich in fiber for good metabolism, and natural prebiotics that encourage proper digestion. To complement these delicious Nutrish dry food formulas, Rachael crafted plenty of savory entrées that are anything but boring. Each has a fun name based on her favorite dishes, like Chicken Purrcata, Tuna Purrfection and Chicken & Salmon Catterole. These meals feature feline delights like chunks of ocean fish, flaked tuna and salmon, liver morsels, shredded white meat chicken, and whole shrimp—all simmered in a delectable sauce. 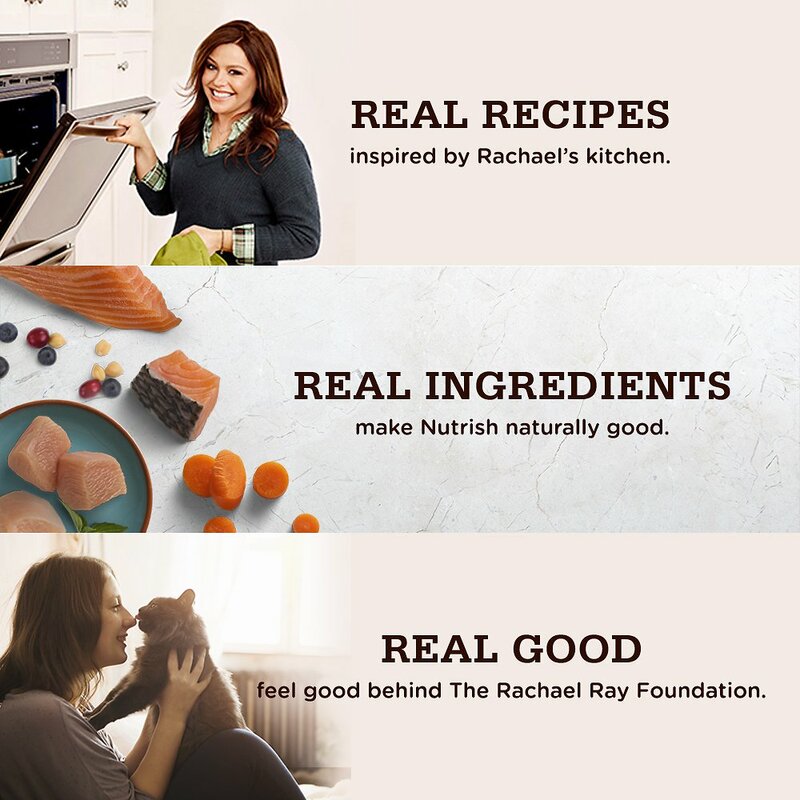 Rachael Ray, America's favorite celebrity cook and cooking show host, teamed up with pet nutrition experts to create great-tasting, high-quality food for dogs and cats. They're simple recipes made with real ingredients that are "real good." Rachael Ray's love for pets goes even further with Rachael's Rescue. The organization has been dedicated to animal rescue since 2008, donating proceeds from Nutrish sales to food, medical supplies and treatments for animals in need. Wasn't sure about switching, but the cats aren't complaining. The Dippin Dots of Cat Food! I have 22 mouths to feed and have tried many expensive name brands. While some cats did well others would have stomach issues and two had to have surgery! I thought I would try the Nutrish food and see how they handled it. All the cats have done well on it and no more throwing up. They love all five flavors and the small bites are easy for them to eat. You know it's a quality food when they are eating and the output is minimal! I have noticed a change in all of them. They are more active and just happier cats. My little girl loved the flavor of the food but I noticed some dandruff occurring while time went on. I didn't understand why she would be allergic to this flavor since she had no issues when she ate the Rachel Ray inner health. I did some further investigation and narrowed my cat's allergy to corn gluten meal which is the third or fourth ingredient in most of Rachel Rays food. Although she is not allergic the corn protein concentrate in Rachel Rays other foods. So she is back on the inner Health or longevity flavors and her skin has cleared up completely. kibble has a nice size and variety. my cat needs kidney safe food, and not sure if this is meeting the needs. we were on royal canin renal support but my cat has decided he cannot take the taste anymore and stopped eating. After reading the bag contents of (no joke) about 40 different brands, wet vs dry, high moisture, etc. I hoped this would help. He transitioned to the food in 5 days, he really (seemed to) enjoy the taste of it. I asked the vet for something to help with the high protein (to help be nicer to the kidneys). Long story short, three weeks into the new food, my cat is not eating enough. he should be eating double and isn't. Wish me luck! My cats love this food! 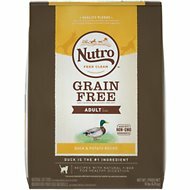 We switched our dog to Rachael Ray's dog food and they kept trying to steal her food so we switched their food to this kind. They don't seem to throw up as much anymore either, which is great! So glad we switched to this food! My kitty likes it so far. It arrived quickly and was fresh. I really like that I can get this in the large bag that my local grocery store does not carry. And with chewy having it delivered to my home is a breeze. First I bought online, freeze-dried, nutritional cat food for cats 10 and 15 yrs. old. They approached the reconstituted "pellets", then backed away from the bowl. Yes, it was mixed, gradually,with their previous food of cornmeal and chicken by-products. a little more each day. Then I bought NUTRISH INDOOR COMPLETE. THEY LOVE IT! I serve it in separate rooms, otherwise the younger one can't get to the food in the one dish. I feed them enough to cover the bottom of the dish. Whoosh. Gone in seconds and yowling for more. Makes both of my cats happy! When you have more than 1 cat it can be hard to find food that both agree on. I have one cat who is 7 and picky and another who is 17 and VERY picky. 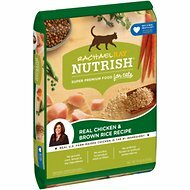 It took several brand attempts, but the Rachael Ray Nutrish dry food is the food my cats both love. I am very happy with the ingredients found in the Rachael Ray food. Overall I am a huge fan of the Rachael Ray brand of pet food and treats. I have been giving my four cats Beyond dry food for many years. I decided to add a little variety yo their diet. I don't know if it's because it's new and different, but it appears they are eating the Nutrish and by passing the Beyond.